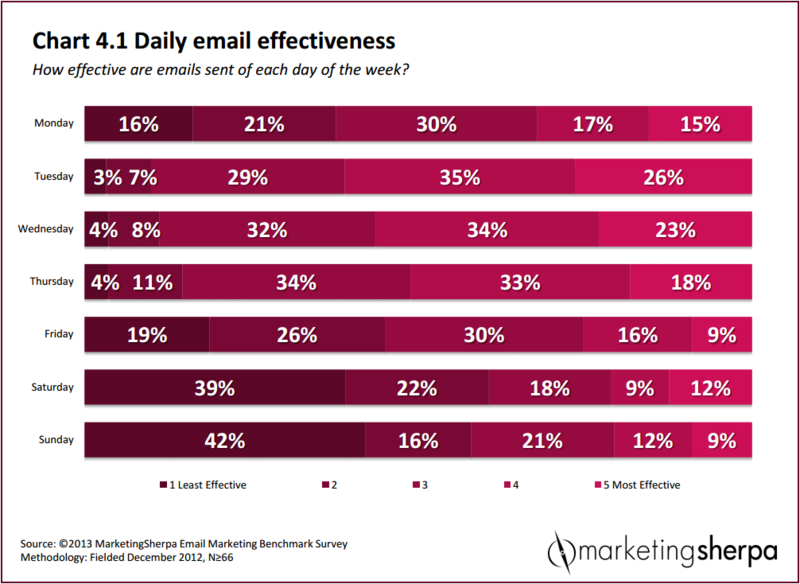 Is There A Best Time for Email Marketing? Home » Is There A Best Time for Email Marketing? Marketers are always on the hunt for the newest trick to interact with consumers and potential clientele. While social media is trending upwards, many are taking a step back and trying to pump some life back into email marketing. The problem with this approach was that no one truly understood when the best day or time of the week was to deliver mail.What I’m here to tell you is that there still is no answer to that question. Furthermore, countless studies have proven nothing other than that the best time “depends.” MarketingSherpa recently did a survey to find which day had the best returns, and when looking at the data you see Tuesday and Wednesday appear to have the most success. However, other than that snapshot, again we find no reliable information on optimal timing. What one has to consider when taking the email marketing approach is that optimization is unique to every individual company and industry; there is no one strategy. The best strategy if you’re taking this route, you have to test once, test twice and test again. When your company runs analysis you can track various interactive metrics including clickthroughs and open rates. Be a student; learn how your email list works. Email marketing is not a lost cause, it just needs to be understood on a case-by-case basis.